the Pertinacia! a battered old (counts as) endeavour class. built from the salvaged hulk of a mostly destroyed dominator class vessel. Jago managed to blag the battered hull off of an eldar corsair pirate (supposedly under truce but who can say with a scoundrel like Kane?) who claimed the hulk was found in one of their local shipping-run/asteroid fields. After dragging it back to the kar-dunaish shipyards he bargained with local cogboys to give her an overhaul and get what was needed to get her back in action. 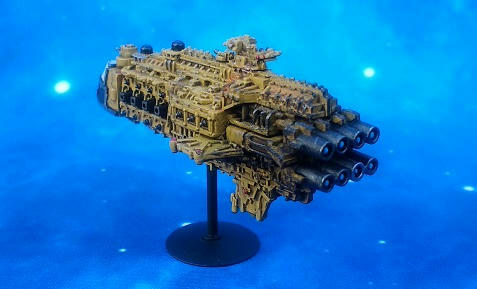 Boarding parties of Skitarii troops reported excessive evidence of deamonic interference in the bridge and engine decks (supposedly when the ship was lost to warp currents or possibly by chaotic boarding actions) and were force to purge said decks with extreme prejudice. long story short; deployment of cleansing explosive charges meant that Jago found himself needing, new engines, new bridge and due to the front half of the ship being missing when it was found, a new prow. thankfully the remaining weapon systems were good-to-go and ready to be loaded with fresh munition. 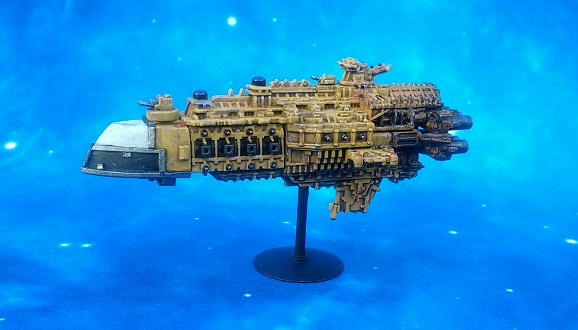 the observant among you will see this conversion uses a plastic imperial cruiser as its core hull. I then made a custom prow from wood in the style of the transport model prows. the bridge is taken from a chaos frigate and the engines are chaos vehicle sprue 'nade launchers mounted on cutdown tau weapons (I feel they look very sw blockade runner). the port and starboard 'wings' are simply cut down for a slimmer/less aggressive profile. 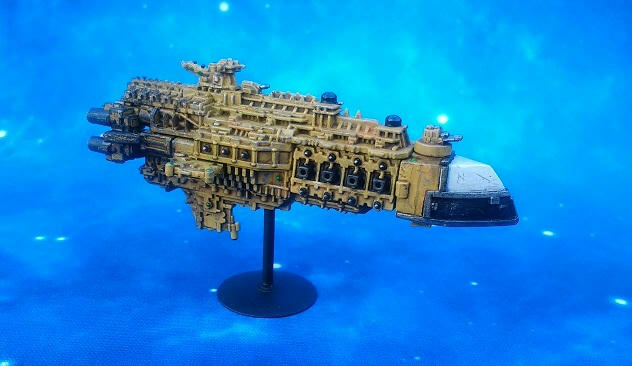 To me, the small bridge and stubby yet chunky look of the vessel help to give the idea that this is not a warship but a vessel that is made by merchant-men and as such reflects this in its design aspects. the paint scheme is deliberately as grubby and weathered as the rest of the fleet. I'm rather pleased with it, but what say you? incoming! ordnance from the vanguard sector! 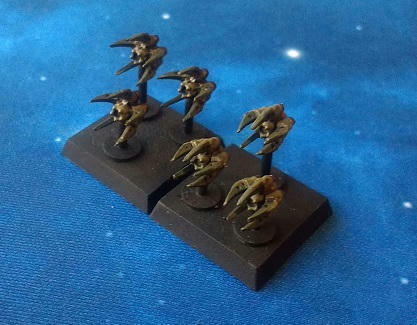 these are the latest ordnance stuff from the talented malika (that are available now from vanguard miniatures). These are simply epic quality, filled with detail and come in two 'positions' open and closed. fantastic stuff! also his 'javellin' fighters are a must as far as I'm concerned. The design ques that form them have everything I like about spacefighters in them! 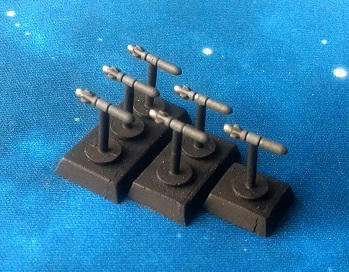 pictured here I have done a pair of them for my merchant fleet, deathwatch and nurgle fleets respectively. that being said, it has obvious visual ties to starwars/galactica too! By the way, I've been wanting to share your pics on Battlegroup Helios' official FB page. Would like to add your name in there for the credits, should I use your username, or would you prefer me to put another name up there? Thanks malika. That's nice of you. My name is Matthew Latchford. My company is the osjc. So yeah I guess I'm Matt Latchford of droppod studios (a subsidiary of the osjc) lols! Do you have FB page you'd like to have tagged when I share your pics? no. no facebook... thanks anyhow. Or maybe a website or anything else you'd like to have shared? We can add it in the description text. No worries. I've shared the pics on our page by the way. Once you have a FB page or website, let me know and we'll share it for you. 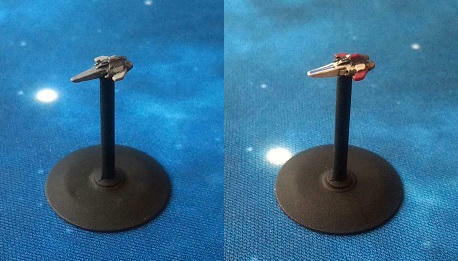 Just bought a couple of Malika's ships from vanguard minis. Meh...Perhaps jago might benefit from this disaster..?